Most people tend to think of cats as familiar, sometimes friendly and mostly harmless domestic pets. However, in ecological terms, they are predators that have been introduced far and wide around the globe by people, and have caused immense destruction of native wildlife in many locations. 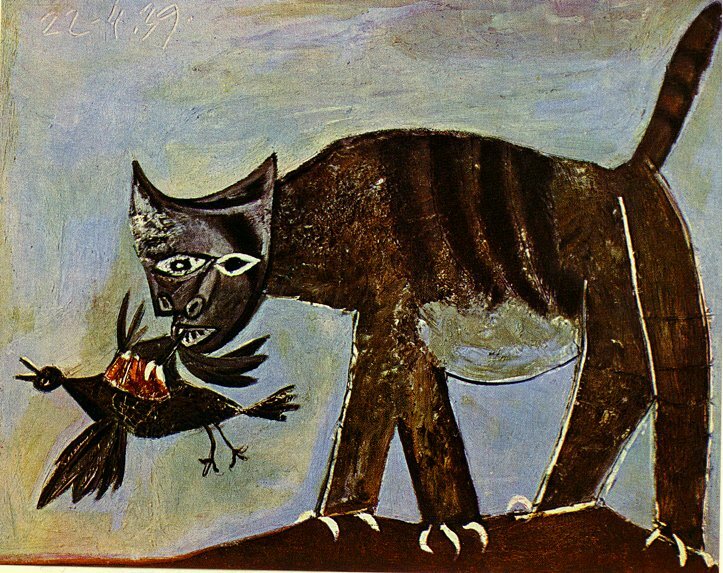 Here in North America, a recent study in Nature Communications estimated that free-ranging domestic cats kill 1.4-3.7 billion birds and 6.9-20.7 billion mammals annually. The population of free-ranging domestic cats includes both owned cats whose owners allow them to roam, and feral cats, many of whom live in colonies that are supported by people. In some of these colonies, trap-neuter-release programs are in place, and supplementary feeding may also occur. 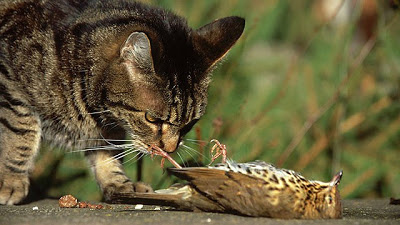 The authors of the Nature Communications study estimate that feral cats are responsible for the majority of cat-related destruction of wildlife that occurs, although owned cats also make a contribution. The scale of wildlife loss due to cat predation is enormous and is estimated to be greater than losses due to collisions with vehicles, windows, buildings and towers, or to pesticide poisoning. The logical response to this problem is to reduce the size of the feral cat population and to control the movement of owned cats. However, proposals of this sort elicit outrage from the many defenders of cats and their well-funded and politically adept organizations. A very good summary of the politics surrounding feral cats and their control can be found in an online article in NYMag. In addition to the issue of direct destruction of wildlife, there are also disease concerns related to the free-ranging cat population. Toxoplasmosis is the disease caused by the protozoan parasite Toxoplasma gondii that uses cats as its definitive host. The parasite is shed in the feces of infected cats and a broad range of animals (including humans) may act as intermediate hosts and may develop clinical disease as a result of this infection. Studies of the southern sea otter, whose populations along the California coast are in decline, found that a substantial proportion of dead sea otters had evidence of infection with Toxoplasma gondii, the agent of Toxoplasmosis. Toxoplasma oocysts are reaching the ocean through urban run-off that has been contaminated with the feces of cats. The cat, I think, comes fairly under the jurisdiction of the Conservation Commission. I wish it would appoint me Cat Ranger. If that were done I can assure you the number of cats would suffer a very serious diminution every year because, as you know, every cat spends most of its time in an effort to kill. It kills not only the mice but every bird it can possibly catch and, as I look at it, each insectivorous bird killed by a cat is worth more than the cat itself. I have proved that there are some uses for cats. Buried under apple trees I have eaten them as apples, buried under rose bushes I have picked them in the form of roses. That is a very satisfactory way of disposing of cats. While we have the semi-wild domestic cat we cannot have a very serious increase in birds and I think it is a fair subject for the Conservation Commission to take up. Some 97 years later, the debate is no less heated.